Phuket, which is in the south of Thailand, is the biggest of the nation’s islands and the most popular tourist destination in the country. Phuket has a slew of attractions ranging from sun-kissed golden beaches to the best of shopping venues. There’s so much to see and do on the island that it can get quite overwhelming for visitors to decide what to do first. Most Thai are practicing Buddhists, which is the religion of the majority in the country. Consequently, there are countless Buddhist temples and monasteries spread all across Thailand. Perhaps none is as visually striking and impressive as the Big Buddha in Phuket. 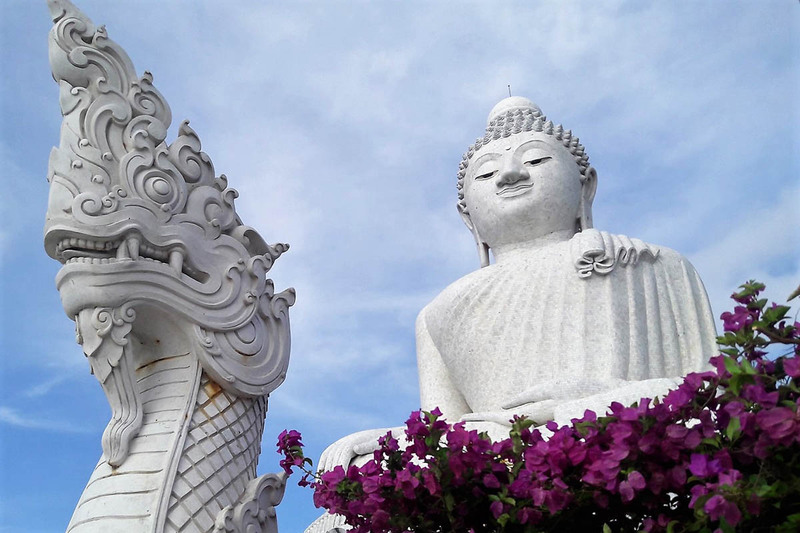 Rising a majestic 45 meters high, it’s made of pure white marble and definitely one of the not-to-miss attractions in Phuket. Visitors that climb to the summit of the statue are rewarded with breathtaking views of the scenery all around Phuket. Phuket is a great place to indulge in some wallet-friendly shopping, with the Phuket Weekend Night Market the ideal place to enjoy some retail therapy. There are rows upon rows of stalls selling an eclectic mix of things including handicrafts, T-shirts, perfumes, etc. There’s also plenty of authentic Thai culinary fare to enjoy if you’re a food lover. The food is reasonably priced, and if you don your haggling hat to shop for gifts, you can pick up some excellent bargains, too. For those looking for an authentic experience of the island, Phuket Old Town is the place to visit. With colonial-styled colorful mansions on almost every street, stores, and restaurants, it’s a charming and more relaxing place to visit, unlike the more crowded parts of the island. It’s a great place to head to when you want to beat the crowds of visitors and tourists in the area. Phuket is home to some of the finest beaches, with Freedom Beach among the most pristine and secluded in the area. While it’s not easily accessible and more remote, traveling to Freedom Beach is a rewarding experience. Those looking for a tranquil beach area with just the sound of the waves, and minus the hustle and bustle found on other beaches, will find just what they were looking for. A serene oasis, the waters are an aquamarine blue with soft, clean sand with coconut trees in the background. It’s perfect for stunning Instagram shots to send back home to friends and family. Those looking to enjoy the nightlife scene in Phuket need to head to Bangla Road in central Patong. It’s a street only for pedestrians and home to plenty of bars, clubs, and pubs that line both sides of the street. The clubs feature a range of women pole dancing, table dancing, etc. with cheap local beer flowing freely and a very relaxed atmosphere. Great for those that like to let their down and party all night long.